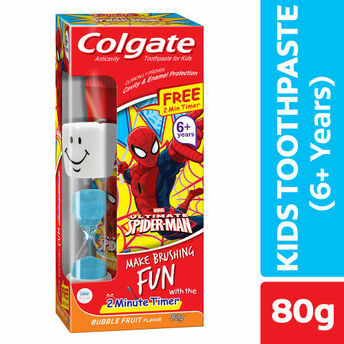 Kids must brush their teeth at least two times a day and Colgate Kids Spiderman Toothpaste is a fun way to ensure they enjoy good oral care habits early on! This delicious fruit flavoured toothpaste is especially designed for children of age 6 years and above who have newly erupted or developing permanent teeth. This toothpaste effectively cleanses their mouth, leaving it fresh. This kid’s toothpaste also provides clinically proven cavity and enamel protection. Sparking colourful gel of Colgate bubble fruit toothpaste makes brushing fun for kids. Developed with the help and expertise of pediatric dentists, Colgate offers a healthy and thorough clean. It ensures your kid’s smile gets brighter and cleaner with every use.